Mods and Rods TV – Love talking about cars! 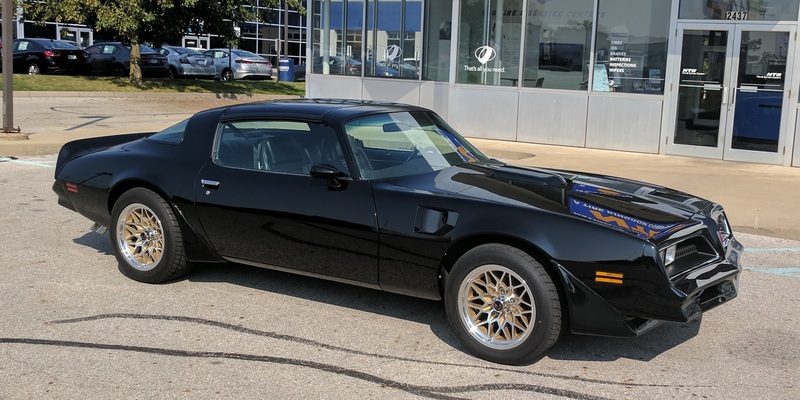 If you have not herd the news, the Trans Am is back from paint and looks great! I took her to DCI Motorsports to be professionally painted, and it is amazing! 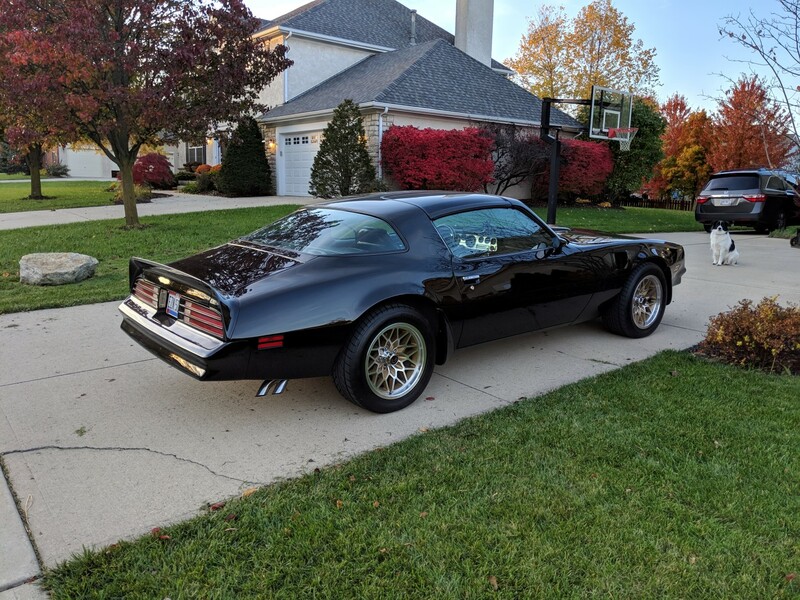 Don Johnston from DCI used House of Kolor’s Jet Black. 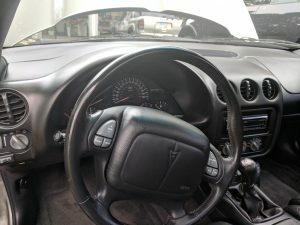 There is absolutely no orange peel, the entire car has been buffed and polished to a mirror finish. Check out the photos. 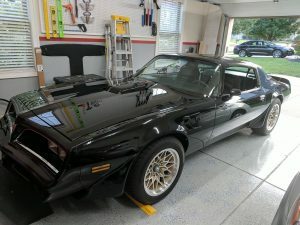 Trans Am body work and paint by Don Johnston and Brandon Bevies. 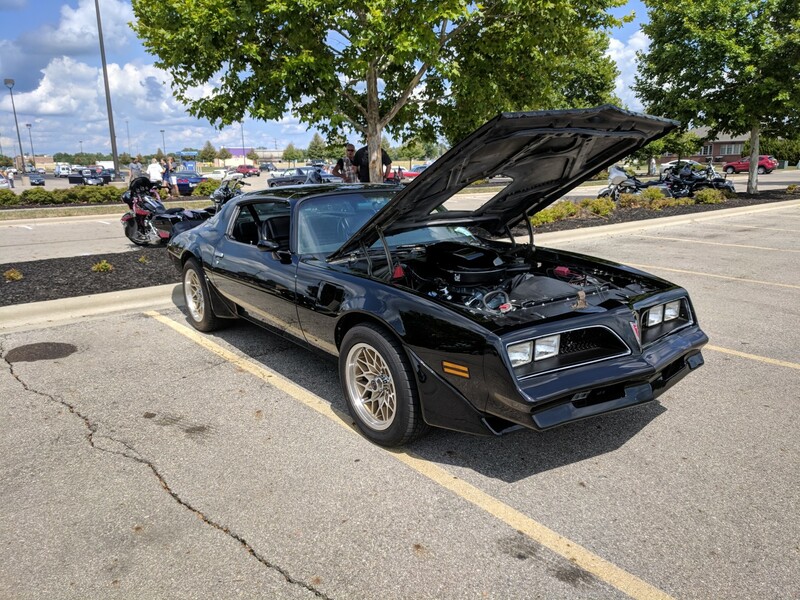 Trans Am painted by Don Johnston and Brandon Bevies. 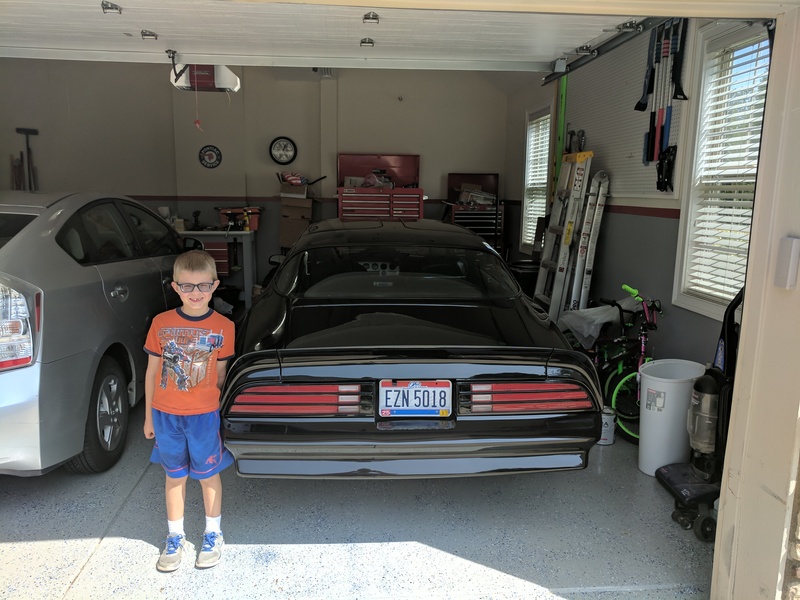 Nicholas cannot wait to drive it. 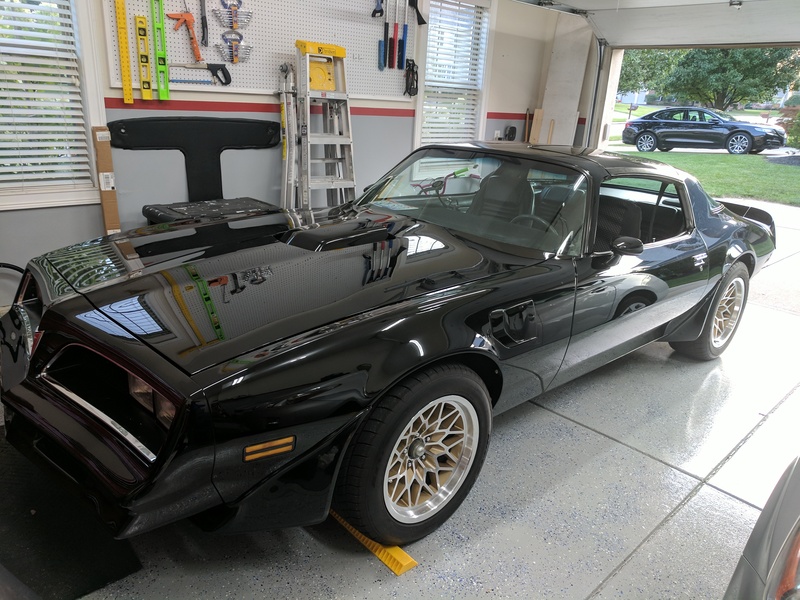 Trans Am in garage safe and sound. 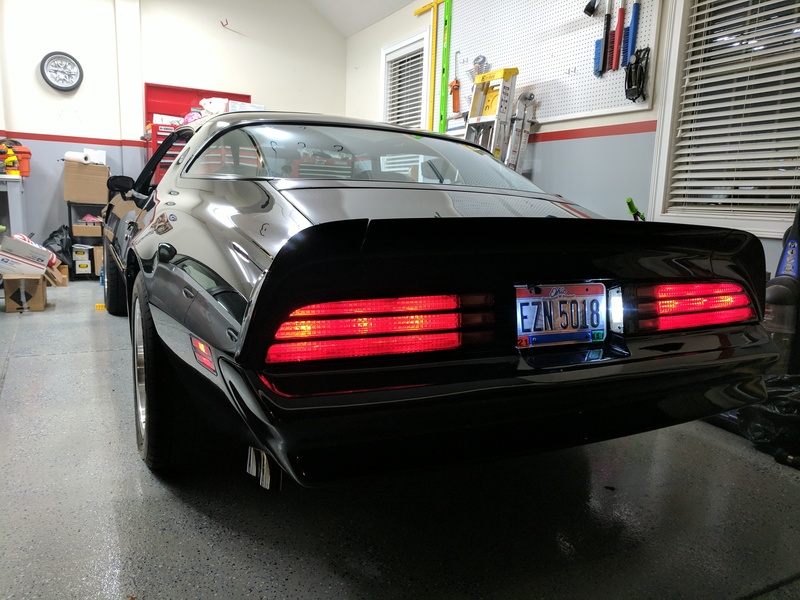 In the garage testing taillights. 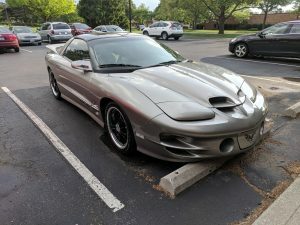 Trans Am getting front end alignment. 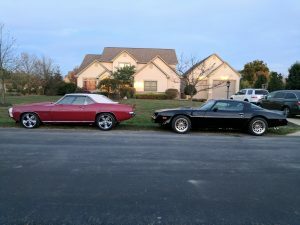 Trans am with friends’ 69 Camaro. Last year Sears quietly announced that the Craftsman, DieHard, and Kenmore brands are for sale. Last week on January 5th Stanley Black and Decker (a very large tool company formed over the past 15 years of various mergers, acquisitions and spin-offs) has acquired the Craftsman brand. Stanley B&D, or Stanley for short, will pay 525 million this year plus additional payments over the next 15 years totaling 900 million. This sounds like a bargain not considering possible inflation that may be coming the next 4 years. But after sleeping on the news I’ve realized that the figurative “wrench” in the deal may make this deal not as good as it looks: Stanley only purchased the brand, not the distribution or existing network of manufacturing relationships. Stanley is not even getting any of the employees from the Sears Craftsman department. Stanley has to start from scratch with the brand name. Actually without seeing the fine print of the deal, they may not even have the rights to use the current logos!!! The Craftsman brand is such a good brand it is hard to explain to someone who does not care about tools its relevance. Essentially everyone who has ever worked on a car, home, bicycle, or something mechanical has had a Craftsman tool in their hand at one point or another. It is recognized beyond the occasional tool user as well, something that other great tool companies such as Wright or S-K do not have. Mention “Craftsman” to a young couple who just bought their first house and they will say “we’re going to need those tools as we improve our home”. When someone thinks “Craftsman”, usually pictures of a red sign with white letters comes to mind, or shiny diamond plated steel. I personally have memories of my dad changing spark plugs and my grandpa fixing the kitchen sink. This is recognition the brand has earned over time and apparently can be bought for 900 million dollars. What does Sears get out of the deal? The deal allows Sears to sell their own existing Craftsman tools in their stores for the next 15 years without paying royalties to Stanley, the new owner of the brand. Sears will continue to get their tools they sell through their current suppliers during this period. After 15 years, Sears will have to pay 3% royalty to Stanley for using the Craftsman brand on what ever products they develop beyond 2032 with the brand. This is all moot though if you are like me and believe Sears will not exist as a physical retailer beyond the year 2020. If Sears is still around after year 2032, they will have to pay Stanley a 3% royalty for products they sell branded Craftsman. Of course they can always simply sell Stanley’s Craftsman tools like any other retailer and avoid this 3% royalty fee. The Craftsman brand will live to see another day which is great, but once all of the Sears stores close, Sears/Kmart will turn into an online only store like CompUSA or Linens and Things. More than likely they will sell what ever Stanley produces with the Craftsman brand rather than continue to maintain their own versions of Craftsman tools. The way the deal works, this gives Sears the ability to have an extra profit margin on Stanley made Craftsman tools without being involved in the distribution or R&D up to 2032. In theory a sears.com website will have the ability to undercut all of the other retailers when selling Craftsman products, which may give the website an edge to help establish the future sears.com as a destination for online tools. Sears has a reputation for acquiring companies and brands. When they acquire brands like Craftsman, they have been quite successful, but when they acquire companies, they usually run them into the ground. One that stands out to me is the acquisition of the Western Auto chain. If you are not familiar, in the 70’s and 80’s Western Auto was a very popular store to not only get auto parts from but also TV’s and other electronics. As I was told up until the Sears acquisition, they were very competitive and in many small towns, the place to get your new TV or VCR. Once Sears purchased them, they were setup for failure, Sears did not want Western Auto stores to have better sales and products. 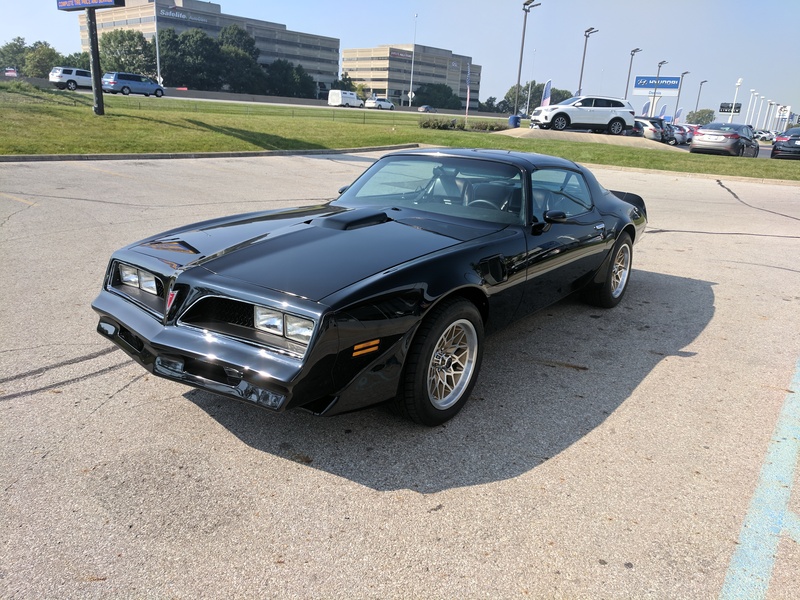 Regardless, it’s gone but what Western Auto had in the 70’s and 80’s is want Sears needs now, small stores and product focus. If I was Edward Lampert (CEO of Sears), I would be much more aggressive at closing existing stores and instead focus on the hardware size stores or smaller. I would drop most of the crap Sears sells today and focus on tools, appliances and things related to that. In a perfect world, Sears stores would be the size of a Radioshack or slightly bigger, offer some stables but primarily be a store front for picking up online orders. Sears can re-position itself as an online retailer with the ability to provide convenient pickup at store locations. I have a lot more ideas to expand on that but well, hire me as a consultant if you want to learn more! 🙂 One thing is obvious though, Someone other than Walmart needs to provide an online shopping experience tied to a store but provide it in a much more efficient way that online-to-store shopping can become mainstream. Amazon is about to test this in some markets, but I suspect this is where Sears could have an advantage with its existing experience in retail. Who ever does this will not have a big box store presence. Instead they would need many small stores providing the possibility for counter staff to learn the names of their customers in the communities they service. This brings us back to the importance of the relationship between the vendor and its customer, something I have witnessed we’ve lost over the last 30 years. I don’t want rotary phones to come back, but it would be nice to go into a store and actually be recognized for more than the plastic card in my wallet. Sears will eventually morph into an online only company, similar to what happened to stories like Linens and Things and CompUSA. If Sears makes this transition slowly and/or because of bankruptcy, they will loose the ability to do anything significant with the Craftsman brand. An online commerce store such as this will not have the profit margins let alone the staff to be able to continue the research and development to create new Craftsman products without the direct help of its vendors. I also highly doubt vendors such as Apex Tool Group will develop new tools to sell exclusively for 1 relaunched online commerce site. As contracts wind down that Sears currently has with vendors creating Craftsman tools, Sears will replace those products with the ones that Stanley Craftsman makes, well assuming Stanley makes those particular products. More than likely an online only Sears will not have the ability to handle warranty claims for the guaranteed for life tools. It is possible though that they offer a limited warranty like what GM or Chrysler did when they went bankrupt. If Sears survives without going bankrupt though we should all assume they will continue to honor the guaranteed forever warranty up until they no longer produce their own sourced tools. Stanley will develop and sell tools under the Craftsman brand. Immediately after the deal is completed, presuming this summer of 2017, Craftsman tools sold at non Sears holdings such as Summit Racing and Ace Hardware will change to tools made by Stanley branded as Craftsman. Stanley will more than likely have a plan in only a few short months to have existing Stanley tools made where they are made currently to produce Craftsman branded variations. Stanley sockets are currently made over seas, one can assume those will be the same sockets re branded Craftsman. Stanley has to do this in order to ramp up supply quickly. It is possible for Stanley to use existing US factories to produce Craftsman sockets and wrenches, but doing so may disrupt supplies for their other brands such as Proto. I personally would love to see Stanley re-launch a Craftsman hand tool line that is strictly made in the USA, they could charge a premium and make them overly chromed (like current Proto tools). This could make a lot of sense as it would allow them to leave the Stanley hand tools as a budget line. What we will not see for up to 5 years is the complete line of Craftsman products that Sears sells. We will not see lawn tractors or snow throwers this fall from Stanley and if we do, it will not be at any significant volume. We should also expect in the 2017 Holiday season Craftsman memorabilia in all stores such as Target, Walmart, etc… This is low hanging fruit for Stanley to quickly make a buck on the brand. Stanley can do a lot with the “brand”, including re-launching every single Craftsman product that Sears sells and/or launching brand new Craftsman branded products. It is possible and likely that they split the brand into divisions for future spinoffs (This is the way of a stock market held company after all). I see the tools division sticking around, while a home/lawn and garden division being built up over 5 years then spinned off in order to make the board and CEO look good and shareholders lots of money. I also foresee Stanley Craftsman licensing out the brand in order to quickly expand the product line and capitalize on the brand as quickly as possible. Similar to how you now see SnapOn stuff (officially licensed products) that has nothing to do with the SnapOn tools at places like Menards. I could see a deal with someone like Samsung to make a Craftsman tablet perfect for use in the garage or just for guys who want a diamond steel plated tablet just because it is cool. A pretty Craftsman logo on the top would easily add a few bucks to a sale. Stanley could make a lot of money from the brand. Time will tell. Stanley has associated the idea that a new 35 million dollar factory will produce US made products and along with the acquisition of the Craftsman brand. This doesn’t mean all new Stanley made Craftsman tools will be made in this factory or all will be made in the USA for that matter. I personally doubt the factory is only for Craftsman tools. I don’t think you can even build a nice size building for 35 million, let alone the tooling to make tools in it. Either it will be a very modest sized factory or it will be very large and serve as a facility that does not require expensive tooling. On the other hand, Stanley has brands that have factories throughout the United States. There are enough of these brands such as Proto and Blackhawk that they could easily be the suppliers for most of Craftsman’s hand tool line. The only problem is I do not believe these factories can ramp up production as quickly as plants in China/Taiwan could to supply the market with made in USA branded Craftsman tools, but I may be wrong. Beyond the Craftsman hand tools, most everything else is already made over seas and I do not foresee that changing. I personally believe a new line of Stanley Craftsman made in USA branded hand tools would be a smart move, particularly for the essential tools (sockets, wrenches, ratchets, pliers and screwdrivers). If I was making the decisions, I would use the Stanley brand to continue selling the low priced imported tools and use Craftsman as a step up quality brand to utilize “made in USA” branding to help identify as quality and to gain patriotic customers that Sears has lost like myself. Realistically though I don’t think key Stanley Craftsman tools will be made in the USA. 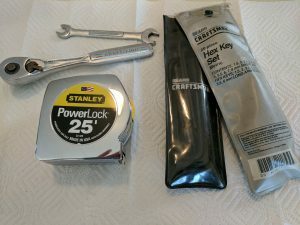 If you look at reviews of the currently imported Stanley socket and wrench sets, they get 4.5+ out of 5 stars and they are priced about the same or only slightly less than current Craftsman comparable sets. Was this a super good deal for Stanley, no! At first I thought this was a fire sale, a good deal for Stanley, but timing is everything and it may be too late to take over the brand and start from scratch. I think Stanley should have added another 1.5B to the deal in order to acquire the distribution and existing contracts to the products. I think the current deal is a fair deal with modest risk for Stanley to refill the product line in major stores before Sears goes out of business. Stanley has a lot of work to do. They now have to start vendor relationships where they never have created products before. Again, Stanley bought the brand, not the relationships or the employee staff that has these relationships. This will take time and may result in quality as well as random supply issues for various products. This will be all of the products which Stanley today does not produce themselves, such as lawn mowers, snow throwers and other lawn and garden products. Attention to detail and picking the right vendors to partner with will be key at every step to replicate what Sears has built up since 1927. I think it will take at least a year to list all of the products and come up with a plan to re-create them let alone start new contracts for producing them. Just to clarify, when I refer to “Craftsman products”, I do not just mean hand tools, but everything from the lunch boxes to the riding lawn mowers. You cannot just re-create all these products over night. One other major problem is that Sears can further damage the brand while Stanley tries to rebuild it. For example, Sears could marketing the same titled 200 piece mechanics tool set as the Stanley version. If the Stanley version is $100 and the Craftsman version is $50, that’s a big problem. Stanley has 2 solutions, either they follow the same formula Sears has now for supplying the Craftsman tools over seas, or Stanley has to distinctively market their new Craftsman hand tools in a different way to stand out from the Sears imported versions. Again, I would put my money on stamping “Made in USA” on Stanley’s versions just so they stand out. One other scenario is that Stanley could produce 2 lines of Craftsman hand tools, one that aligns with the current pricing and products sold at Sears and a new line like the old “Craftsman Professional” line that is branded Made in USA. Craftsman products sold at Sears/Kmart will remain as we know them today so as long as Sears is still in business. More than likely how it is now will not change, the tools that switched to made in China (e.g. sockets, ratchets, wrenches, etc…) will remain, and the classic screwdrivers and pliers made by exising US suppliers will remain until those contracts expire. At this point Sears made all the cost cutting they could do to save money, any other changes now to widen a profit margin to help Sears itself is not worth the time. Craftsman products sold in other outlets into the future (such as Amazon.com, WalMart, etc…) will be developed by Stanley. They will most likely be re-tooled products that currently have the yellow Stanley brand on them, most of which are made in China and Taiwan with some specific tools like tape measures made in USA with global stuff. It is possible, and I am hopeful, that Stanley instead uses their existing US based tool factories to launch Craftsman Made in USA tools. It is unclear if Stanley Black and Decker will honor Craftsman hand tool guaranteed forever warranty. Technically the products from Stanley will be “new” products so it can be assumed that if you want your Craftsman ratchet warranted you will need to go to a Sears store to get a Sears made Craftsman replacement. The deal does not indicate that Sears is giving Stanley Black and Decker access to their existing suppliers or that the employees of the Craftsman division will transfer to Stanley. One can assume that a “Brand with Suppliers” and or “Brand with Suppliers and Staff” deal would have been much higher than 900 million. Stanley will capitalize on the Craftsman brand immediately using their current resources to produce Craftsman products. Any product under Stanley B&D and its family of brands could be re-branded Craftsman in short order. Stanley will take time to setup contracts with new suppliers for products they do not already produce such as lawn mowers and snow throwers. Do not be surprised if Stanley does not offer nearly as many products branded “Craftsman” as Sears does today. Will we see Sears Craftsman tools in stores soon? No! The deal ends the ability for Sears to distribute Craftsman branded tools outside of their stores. Sear’s developed Craftsman tools will only be available at Sears stores. Stanley will not be distributing the current Craftsman products sold as Sears to other retailers. If there is a specific Craftsman tool sold today at Sears, you will have to go to Sears to buy it. Will Stanley Black and Decker honor the Craftsman guaranteed forever warranty of tools sold by Sears? I doubt it. Based on the fact that they did not mention that in the initial announcement one can guess that the answer will be no. The fact that Stanley will develop new tools that they sell with the Craftsman brand implies that they will more than likely have new part numbers purposely so it is easy to identify Stanley’s versions to Sear’s versions. Latest news (see February 2, 2017 update below) Stanley will continue to warranty existing Craftsman tools, so that is great news for us that have made the investment with that in mind. Will Stanley Craftsman tools be guaranteed forever like Sear’s Craftsman? I think so. Between the marketing advantage that gives along with the competition having a similar warranties one can only expect this to be the case. Wright Tool, H.J. Williams, Stanley, and S-K have such warranties. Will Stanley Craftsman improve on existing C3 Power Tools? I doubt it and here is why. Stanley bought the brand Craftsman. I did not see where they also acquired the R&D or the contracts/relationships with existing vendors. Stanley already has a few other brands such as Black and Decker and Dewalt that makes power tools. If they do anything, they may make a new line like C4 or something, but they will be different and most likely use yet another new battery format that is exclusive to that new model line. Will Stanley Craftsman Sell lawn tractors, mowers and snow throwers? I would hope so, but Stanley’s current portfolio of products does not include these large items so they cannot simply have a couple board meetings and make things happen. It will take time for Stanley to work out contract deals with either the same or new vendors who currently make these products for Sears Craftsman. Plus one can assume that most vendors will not be eager to supply Stanley with products that will then compete with their own in non Sears stores. I predict it will take up to 5 years before Stanley can fill most of the product line that Sears currently provides. Time will prove me wrong or right. But, read my thoughts on this above, this is an opportunity for Stanley to build up something then spin off that division to make their shareholders happy. Also more important to note the more they rely on other vendors to provide Craftsman products the higher the risk is that they could damage the brand in the process. I am a strong believer of buying American made tools when possible. There are still some Craftsman hand tools sold at Sears that are made in the USA such as some of the mechanic’s crow bars, pliers and classic handled screwdrivers. 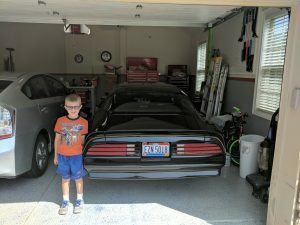 Otherwise I have been filling the missing wrenches and sockets with other brands such as Wright, Proto, S-K, Pratt-Read, Klein, and MasterForce (Menards house brand). Since I purchased a Wright 3/8″ drive double paw ratchet I have been a big fan of Wright Tool’s line of sockets, ratchets and wrenches. I’ve also been buying new old stock (NOS) made in USA tools such as Craftsman, Kobalt, KD, Allen and NAPA on eBay over the past few years. I am not concerned about the Craftsman guaranteed forever warranty. I’ve only used the warranty a couple times on screw drivers from my younger years. I now know better not to use a screw driver as a prybar, or a ratchet to break loose a torqued down bolt. pry and breaker bars exist for a reason. I am sad to have watched the change of Craftsman hand tools going from a good middle of the road quality tool brand to a brand with some good tools and others comparable to Harbor Freight tools. Many folks who don’t really dig deep into the importance of quality do not think there is a real difference but there is. My best example is the time I used a 3/8″ to 1/4″ drive adapter from Harbor Freight. I was tightening a small fastener to a trailer I was assembling and the tip snapped right off while tightening the 2nd fastener. 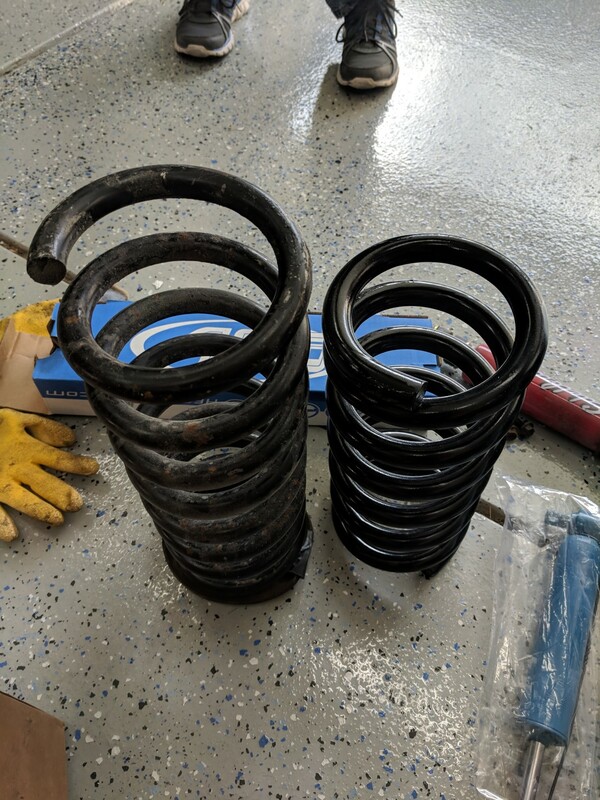 Trust me when I say this, but it should not have happened, the bolts should have sheared first if I was truly over torquing. 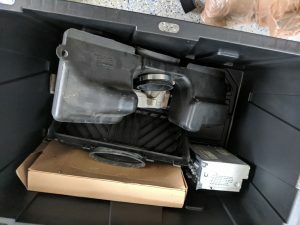 I went to Sears and got a Craftsman 3/8 to 1/4 adapter, went back home and finished installing the remaining 30+ fasteners without any issues. What initially cost $1 at one store ended up costing me an hour running back to the store to spend $5 to finish the job. Lesson learned, if you value your time do not buy crap. It is true you can produce quality tools anywhere in the World, and I am sure there are quality tools coming from Taiwan and China. If you look though the vendors who sell these quality imported tools charge the same amount as the Made in USA competitors, and they are not innovating the space like the USA made companies are. So why support a company that doesn’t have plans to improve their products? If you are not aware, Snap-on, Wright and S-K now produce combination wrenches with extra gripping ability on the open ends. S-K also includes a new ratcheting end to their combination wrenches that has an extremely small amount of ratcheting movement (arch to each click). Watch the videos on Flank Drive plus, WrightGrip and X-frame wrenches, these wrenches will blow your mind that they can shear off the head of a grade 8 bolt without slipping. Hand tools are ever changing to meet the needs of our world. As newer cars require less repair, the next big innovations coming like the Tesla 3 electric car will require even less mechanical maintenance, while recreational and hobby use will put new demands on the tool industry to provide quality tools. Even though it is sad to watch the industry change, I believe it will also evolve which is a good thing. If the new line of Stanley Craftsman hand tools are made in the USA then awesome, they may just eventually end up in my tool boxes. Either way, I still have other tool brands such as Wright Tools that will be making their way into my tool box in the near future. According to B2BeCommerceWorld, Stanley has a plan to sell Craftsman products online, more than likely they are referring to Amazon.com. This makes a lot of sense. It also sounds like Stanley will continue to honor existing lifetime warranty on the tools, which is also great news and a smart move on their part! Hopefully they will bring hand tool production for Craftsman tools back in the USA, but there lies the challenge, there will be owners of newly purchased Craftsman tools that are made in China that now Stanley will have to replace with USA made versions. Perhaps they can create a policy that if you bring in a traditional Craftsman tool made in USA you get a made in USA craftsman replacement, but if you bring a recent Chinese made Craftsman tool they exchange it with a Chinese made Stanley tool. I think that would be fair. What I hope not to see is Stanley release Craftsman sockets that are also not made in the USA, that will continue to tarnish the Craftsman brand instead of inject new life into it. Last fall I made a custom drop base for my Trans Am. 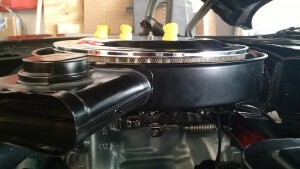 The drop base is needed in order to fit the shaker under the factory hood when using aftermarket parts that raise the intake flange (mounting point for carburetor/throttle body) higher than factory. Before I go any further, I want to make it clear that I do not recommend building your own drop base. I spent about $150 on materials, an initial 8 hours making the drop base, plus endless hours afterward trying to make it work. The final product was not as I hoped. See the photos to see the results. Please consider one of the solutions I list next before making your own drop base. A permanent drop base solution is to do one of the following. 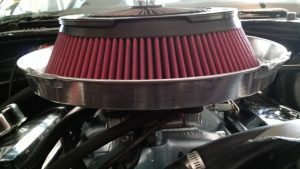 Factory Intake – You can modify a factory intake then use an adapter such as the Edelbrock 2732 (if necessary, was not in my case), assuming the carb/EFI provides mounting holes for spread-bore mounting. FiTech EFI throttle body provides spreadbore mounting holes, so no adapter was needed. 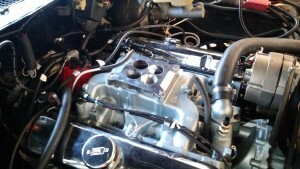 Please see Modified Factory Pontiac Quadrajet Intake for Square-bore FiTech Throttle Body EFI. 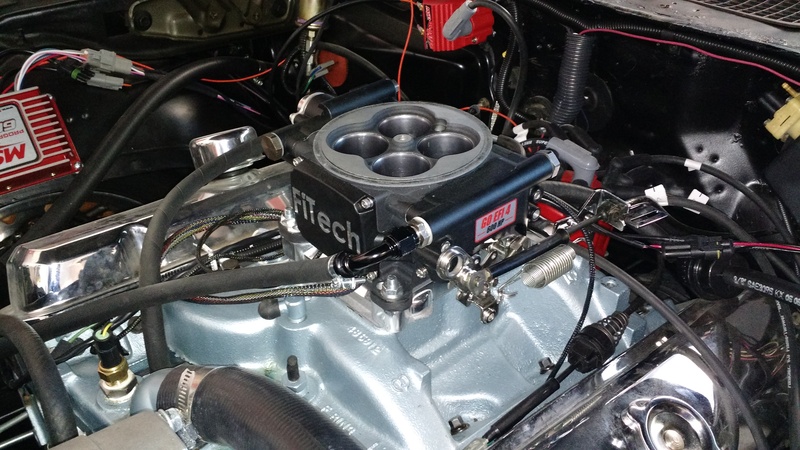 Edelbrock Performer (not RPM) – The Edelbrock Performer intake puts the carb/throttle body at about the same position as factory and provides direct square bore mounting. Note a factory Pontiac intake will more than likely outperform an Edelbrock Performer. Other than weight savings, I would recommend modifying a factory intake before switching to a Performer intake. Other aftermarket factory height intake. There are some single plane intakes but if your engine is designed for dual plane I would not switch. 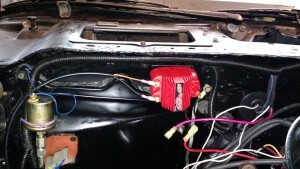 Pro touring F body Drop Base – Uses Airaid cone shaped filter. 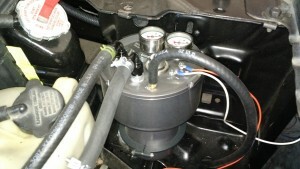 Ram Air Restorations Drop Base – Uses Airaid cone shaped filter. 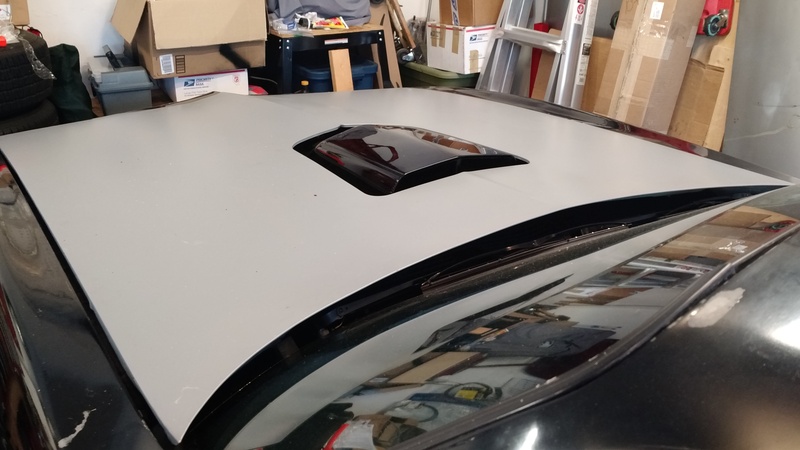 Blocker’s Drop base – Uses modern rectangular air filter, requires modifications to shaker. Butler Performance Drop Base 77-79 – Uses modern rectangular air filter, requires modifications to shaker. All of the above solutions are a compromise. All of the above require that your shaker is cut in order to function properly. 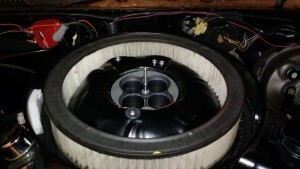 The Airaid solution utilizes the traditional round air filter method. The good thing about this solution is that other than the drop base itself, the air filter is sealed like factory with a round air cleaner lid. The disadvantage is air turbulence created when the air first flows into the shaker, then around the air cleaner lid then through the filter. I did blow some air with a fan through the filter at angles and could not tell if it was impacting the speed of the air but I think it is a concern none the less. More importantly it puts a smaller clearance between the actual carburetor and the lid top which is restrictive. 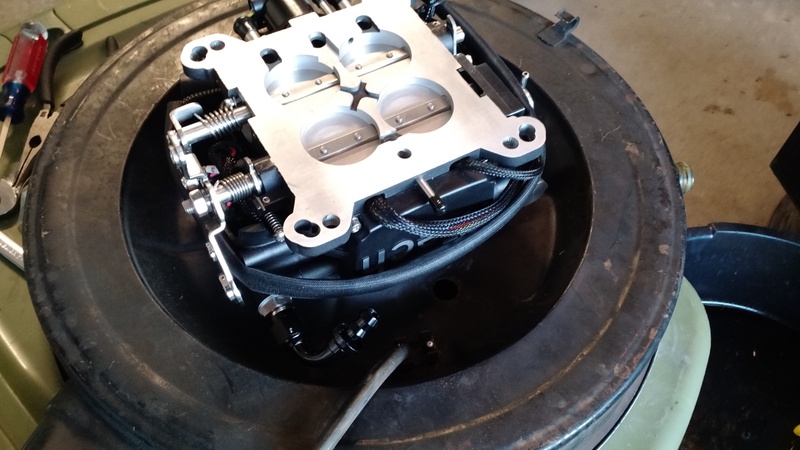 If you are running a throttle body, that clearance may not be as critical, but if you are using a quadrajet, the secondary walls may be very close to the top of the air cleaner lid. The rectangular air filter solution requires that your shaker be modified to allow air to flow through the square filter. This solution presents the same issue as the Airaid filter in that the air flows through the filter at an angle. 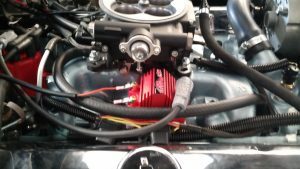 One advantage is the air only has to make one turn, rather than flow around a lid then up and into the carb/throttle body. The biggest drawback to this solution is sealing. Air filtration could be breached around the edges from the plate that is glued to the top of your shaker as well as from the gab between your shaker and drop base. One solution to this problem is a re-designed shaker. I have a few ideas but no time to make them a reality. 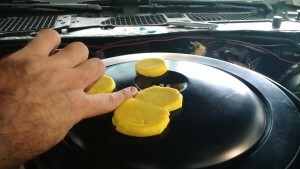 Another solution is to redesign a completely different air filter lid. Perhaps someone can take inspiration from the K&N filter lid I modified to build something better. I do not recommend building your own drop base, but for those who want to know how I built mine, here are the quick and dirty instructions. I used a K&N drop base #3549, a 16″ diameter 1.5″ deep pizza pan, and an Airaid #801-452 filter (14″ diameter on the bottom and 10.75″ diameter at the top), and a K&N filter lid #66-1101. I cut a hole in the pizza pan and then used bolts with rivet style heads and lock washer nuts to fasten the drop base to the pizza pan. Other than drilling holes for the rivet style bolts, I did not modify the drop base. I also modified the filter lid with a slight cut in order for it to clear the shaker. Once I put this all together I was initially quite pleased with the results. The shaker did not rub against the filter lid with my relief cut in the filter lid which was initially my primary concern. What I did not anticipate was the shaker not fitting properly on the pizza pan because the diameter was exactly 16″ in diameter, whereas the factory air cleaner lid was actually 16-1/2″ in diameter. To compensate, I added 4 pieces of metal at four corners. This worked except it allowed the lid to slowly turn. A quick solution was then to add duct tape at each corner to provide enough friction for the top shaker not to move once the shaker ring is tightened. AS soon as I added duct tape to the assembly I realized this was not worth my time. 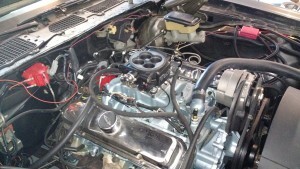 I am going to take the factory intake off the motor and take a grinding wheel to it! 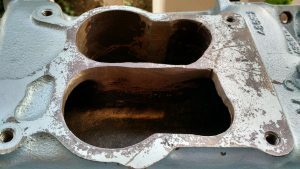 The plan is to open up the holes to allow for a square bore to be mounted directly to it with the use of a very thin adapter (Edelbrock 2732). I will post when I do this. 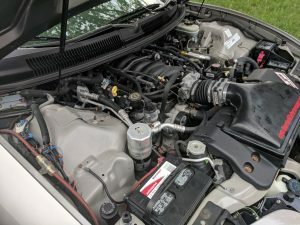 Update: I did what I wanted and modified a factory intake, which is the best solution to this problem. 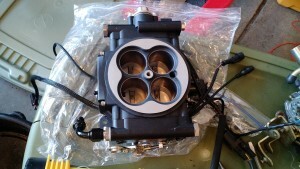 Please see Modified Factory Pontiac Quadrajet Intake for Square-bore FiTech Throttle Body EFI for details. 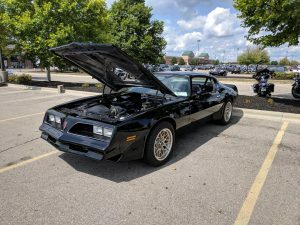 FiTech Go EFI 4 installed in a 1981 (to 1978 conversion) Trans Am was a success. Please follow the post completely for details of the process. I’ve only put 120 miles on the FiTech so far, but I have to say it’s worth every penny. I’m a geek (I write software for a living), having the ability to tweak settings from a hand held controller makes me happy. Having the LCD display providing me real time AF ratios, engine temperature and rpm at the same time is pretty sweet too. 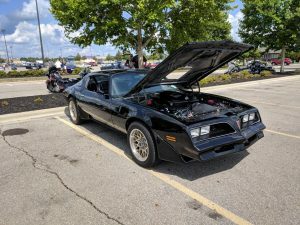 Throttle response is not delayed, I expected it to have a delay like most modern fuel injection cars do. 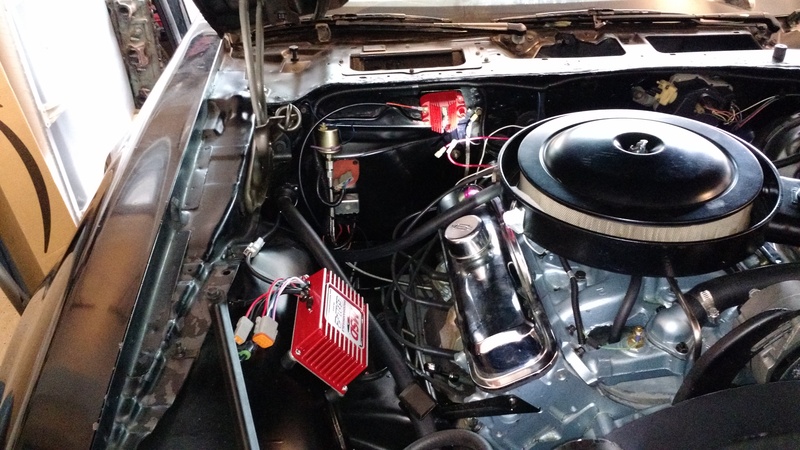 Throttle response is as instant as a carburetor. As fast as I can turn the key and let go is how fast it starts. No more high to low engine rev at startup, it starts and stays right at 750rpm. When I put it in gear, there’s a slight drop in rpm then it’s back up to 750rpm. I may drop the rpm’s down another 50-100 rpm once I’m satisfied with everything. Best part is, I can change this with the handheld controller. Engine has never ran this consistently cool before. I have a 160 thermostat, usually my car would get as hot as 195. It now stays between 165-175. 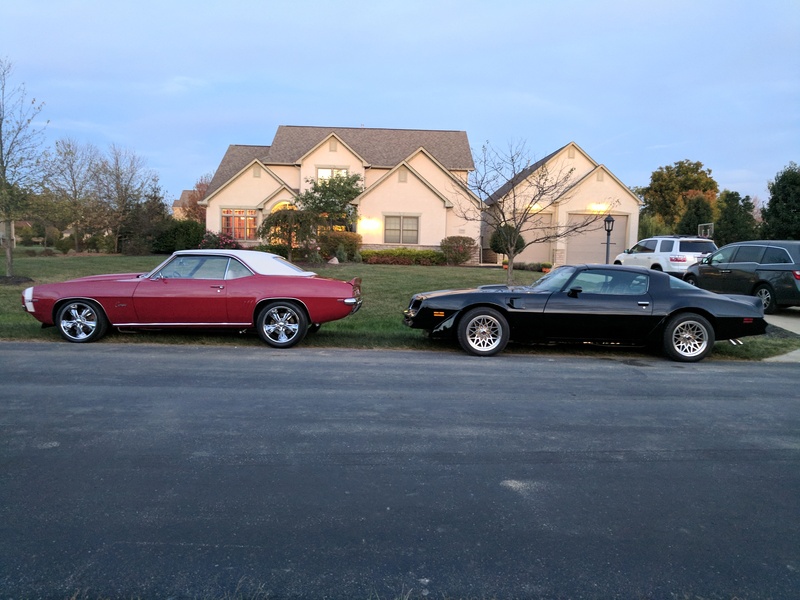 The first thing I did when I got home was test the FiTech with my 78 shaker air cleaner. 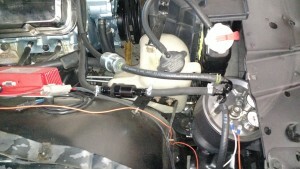 As you can see in the pictures I did not undo the wiring around the throttle body until after the test fit. Luckily it clears, but just. See the video, you can see I can just pass a sheet of paper between the drop base and the side of the FiTech where I believe the fuel return system is housed. This test was without a gasket between the throttle body and air cleaner, which has given me a touch more space since I took these pictures. 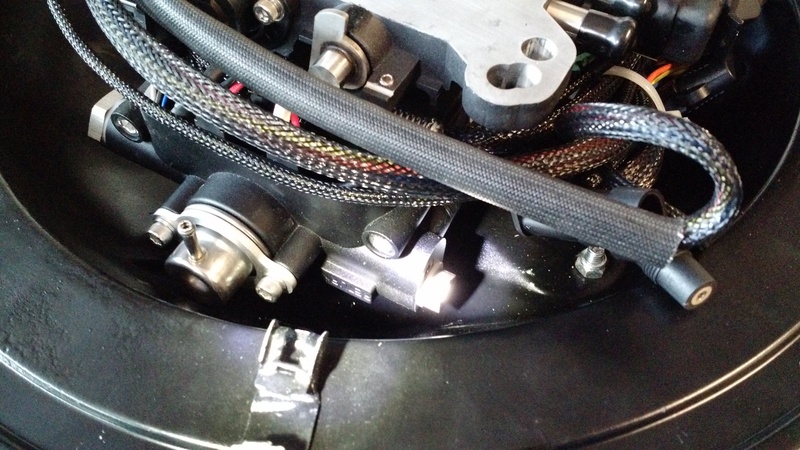 Note: FiTech throttle body clears when using a 90 degree AN6 fitting for the fuel inlet and the return line is capped (you can do this when using their fuel control center). A factory air cleaner drop base (shaker air cleaner) will not clear without modification if a return line is used. I took some measurements from center to send to the Pro Touring F Body and Blocker’s Performance to see if their drop bases will clear. 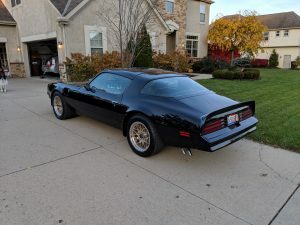 So far I got a response (in less than 4 hours) from Pro Touring F body. 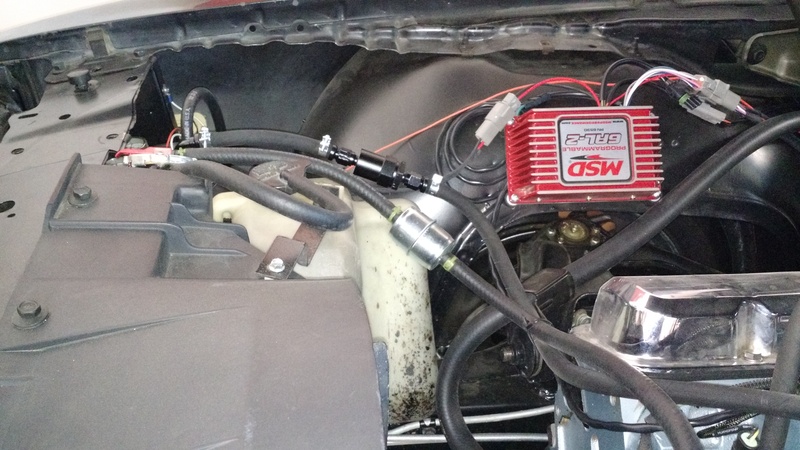 They recommend going with their 1-1/2″ drop base, then adding a 1/2″ carb to air cleaner spacer. Doing so will provide over 3 inches of space (A) between the air cleaner ring and the outer drop edge. (see image with line markings A and B). I believe the Blocker’s drop base will also clear. I will update this post when I get confirmation. The tightest point is the very edge of the side with the return line bulge, it’s exactly 5-1/8″ from center. The height at this point is 5/16″ higher than the air cleaner mounting ring. 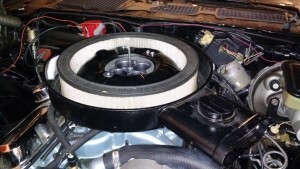 This is the only area where the FiTech is higher than the air cleaner mounting ring. 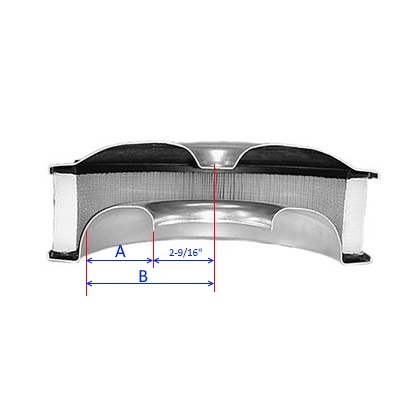 The maximum width from center is 5-1/2″, which is at the same height as the air cleaner mounting ring. Any Drop base designed to fit under a Pontiac Quadrajet (which has an external vent hole at front) will easily clear this 5/16″ height above the air cleaner mounting ring. As long as measurement A is 3″ you should clear with no issues. 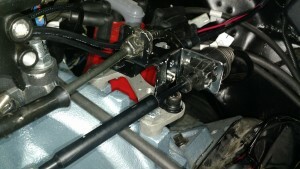 For now I took the simple approach of using an Edelbrock 2696 Square-Bore to Spread-Bore adapter. 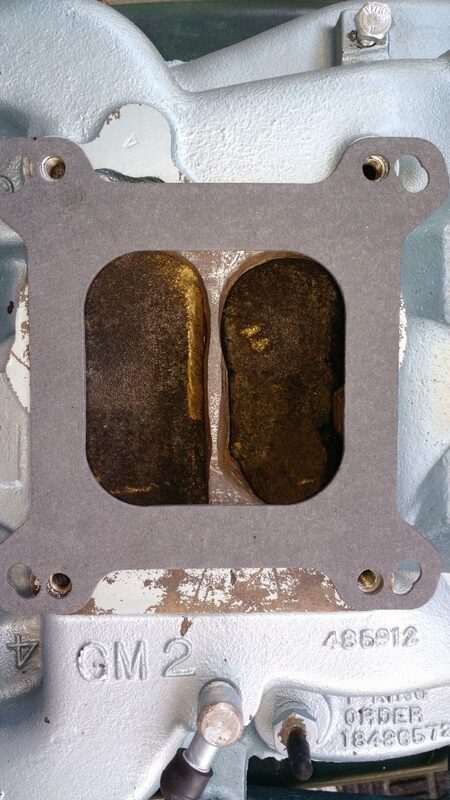 The quadrajet gasket it came with did not line up properly so I used a thin Mr Gasket quadrajet gasket to get the job done on the intake side. 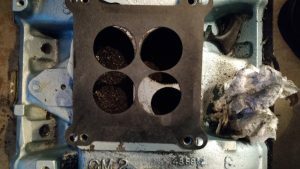 I am thinking about taking the factory intake off and grinding away the quadrajet holes to allow the square bore holes to feed the factory intake directly. 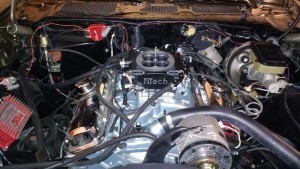 The FiTech comes with both square and spread bore mounting holes, so it is possible to mount it directly once the intake is modified. If I do this, then I would only need an Edelbrock 2732 1/16″ thick adapter plate. 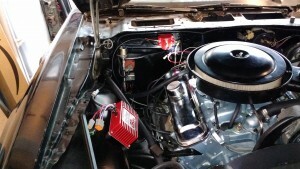 Then I could keep the factory air cleaner and mount the shaker directly to it. It may also give me slightly better performance, though I am doubtful. 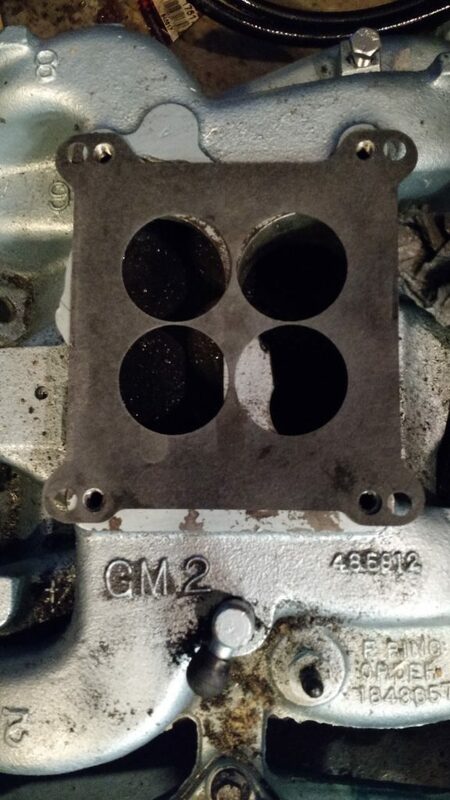 The primary holes of a spread bore are slightly smaller than the throttle body square bore holes, which may be costing me some horse power. 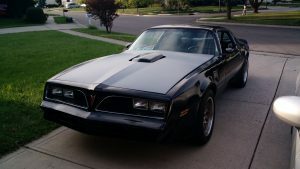 If I don’t modify the intake, when I switch my hood over to a shaker hood I will have to run an aftermarket drop base. I think I decided to go this route, at least for the next year. Here are pictures of the Throttle body and mounting hardware just before I installed them. I wanted to point out the quality of the materials used. The throttle body is heavy and has a very nice finish. The brackets for the fuel center are very thick and feature the FiTech wording cut into the brackets. In my case, you will never see this as I have this tucked within the core support. Initial installation took 4 hours. 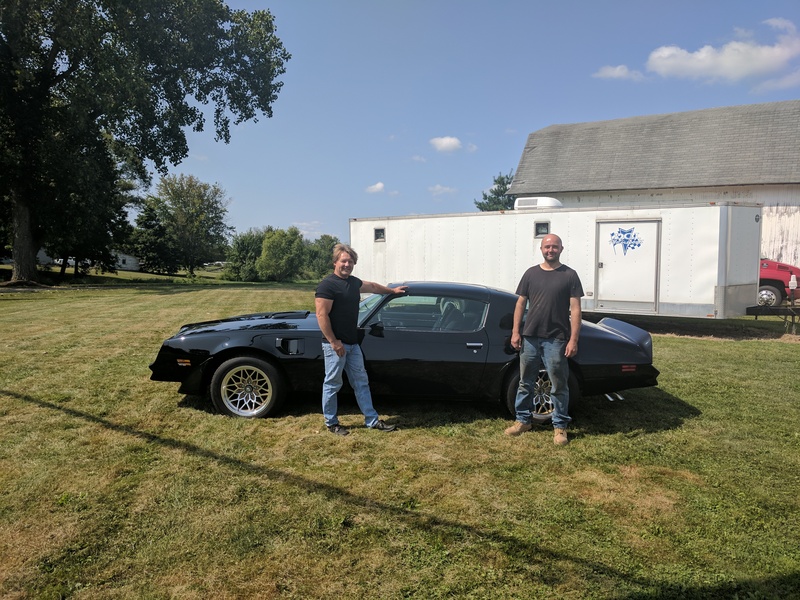 My friend Joel (check out his Firebird) was a big help. Thanks Joel! I have since spent another 4 hours tweaking things such as a better position for the throttle bracket and rerouting the PCV line. At the moment I am using the factory 78′ w72 drop base with a 3″ air filter and a flat air cleaner lid (not ideal). This is currently under a 1981 turbo hood. Everything clears with the flat air cleaner lid. I spent a good hour sitting in my car thinking about how I would permanently mount the FiTech handheld controller. I then went back to the box the system came in and grabbed their mount for the controller. I just mounted it to the window as you see in the pictures and got to thinking. 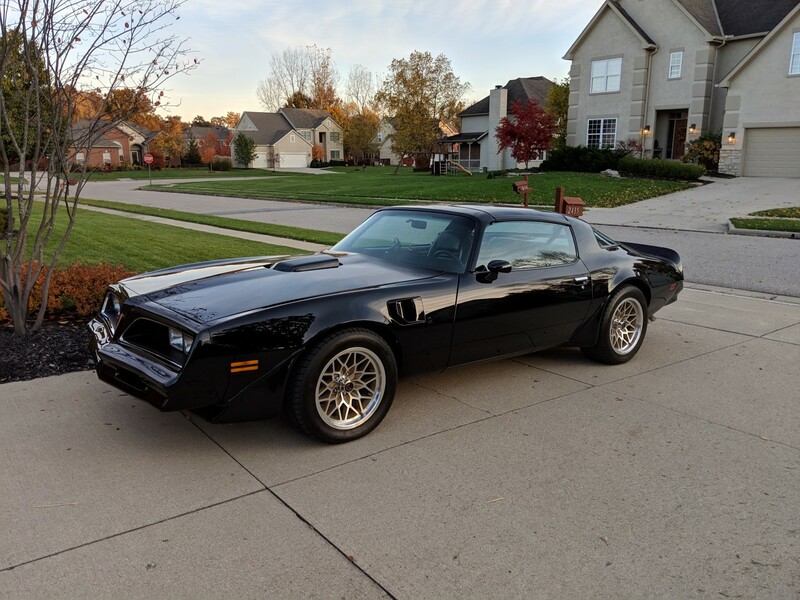 I decided I’m just going to keep it portable, this way I can take it down and hide it in the glove box at times I want to clean up the view in the interior. 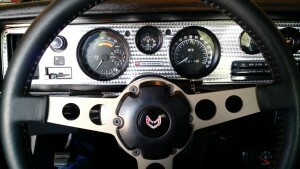 In the map pocket you can see I got Randy’s 3 pod map pocket gauge cluster adapter. 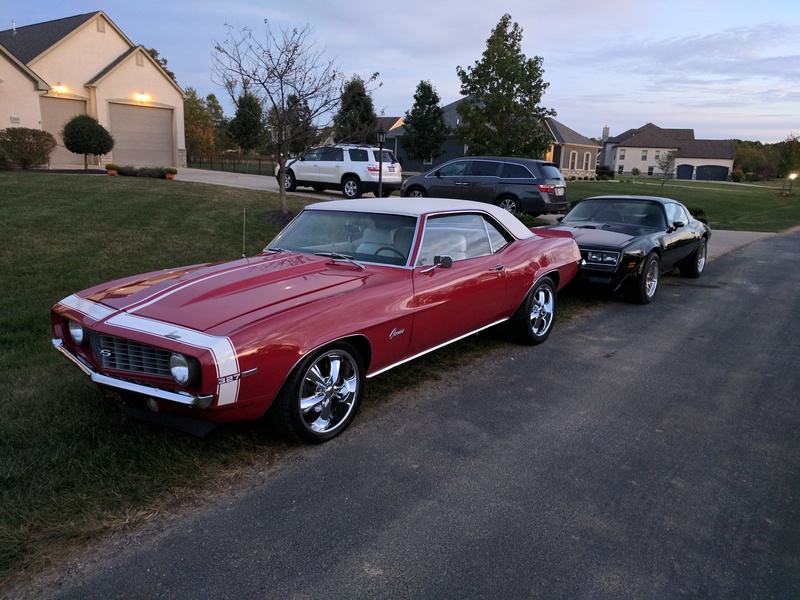 At the moment I have AutoMeter electric oil pressure and water temperature gauges as well as an AEM air fuel ratio gauge. At the moment the temperature gauge is not hooked up because the temp sender for the FiTech took it’s place on the intake manifold. 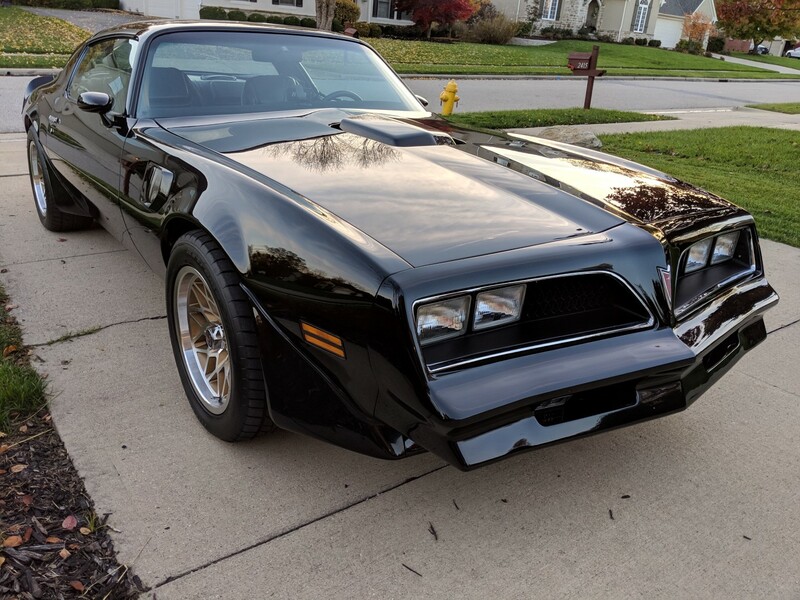 I’m on the fence on hooking this back up. 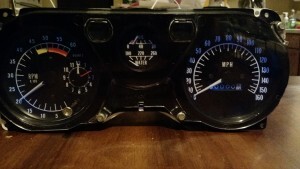 I still have the temp gauge in the factory cluster as well, though it is not accurate it is at least consistently inaccurate (laugh out loud). Now I know why most modern cars with temp gauges just show a sweep without temperature numbers. As long as the FiTech can give me the engine temperature I may just remove the AutoMeter temp gauge. 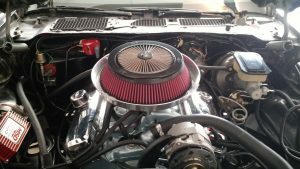 The first day I got the FiTech installed, I ended up using a two inch 5/16″ bolt to hold down the air cleaner to get the job done and go cruising. The next day I did some hunting and found at the local Advance auto parts the part I needed, Mr Gasket 6399. 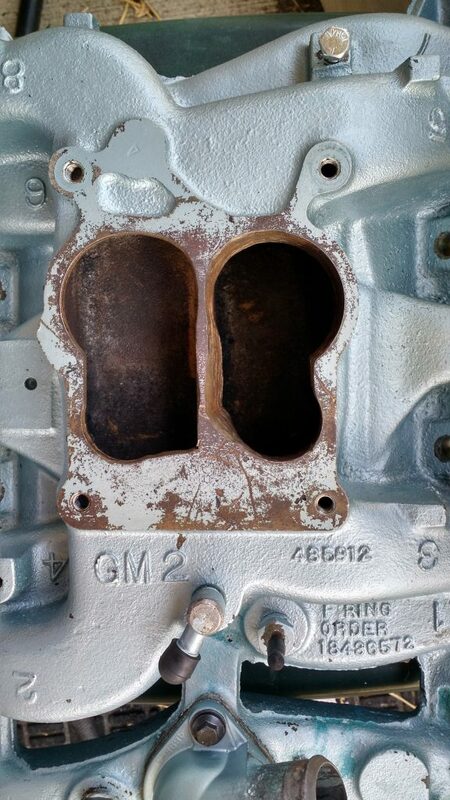 I have a 1972 factory intake. 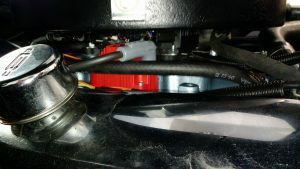 The 72 throttle bracket worked perfectly with the quadrajet, but now with the FiTech, it appears the throttle cable needs to move back about 1/8″. At first I was considering going to a 75-79 throttle bracket. When I was looking at all my intake parts in the basement I remembered the adapter that the Edelbrock Performer intake came with. That bracket ended up being perfect for 2 reasons. 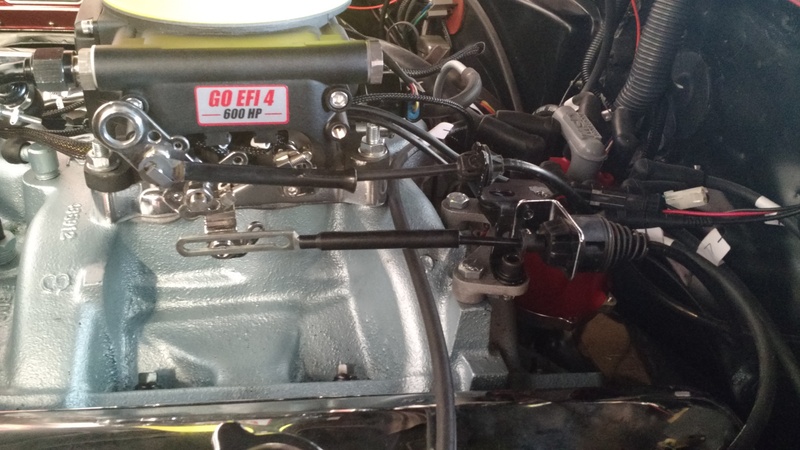 It raised the bracket up enough to better align with the FiTech (acts as a spacer for the throttle bracket) and it brought the 72 throttle bracket back about 1/4″. For the transmission I used a kick down bracket from one of those cheap universal throttle cable kits and mounted it on the center of the 3 holes on the factory throttle bracket. 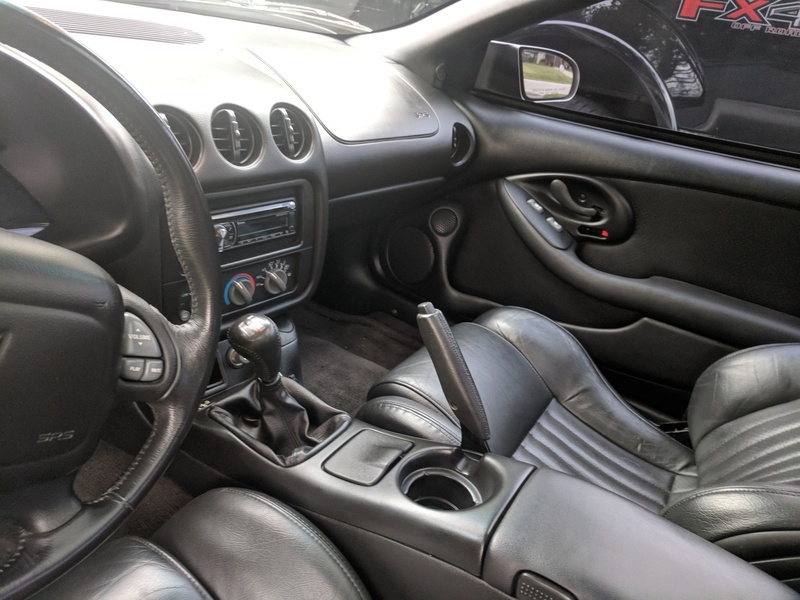 Only thing left is to put a 1″ spacer of some sort from the throttle to mount the kick down stud to (that way the kick down clears the return spring, not installed in this picture). I am going to Jegs at lunch today to get that sorted. 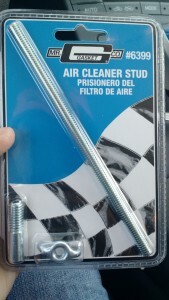 Update 1: A kick down stud is on order, should be arriving in 24 hours (Jegs had to ship it from their warehouse). I tested the clearance with the factory lid with the kid’s play-doh. The air cleaner lid I am using is not ideal, but for now I am running a flatter air cleaner lid to give myself about 3/4″ clearance with the hood. 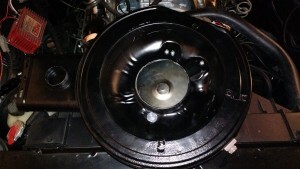 The factory air cleaner lid only provided about 5/16″ of clearance, which I am not comfortable with. I am not a fan of permanently modifying factory parts unless I have to. With the drop base, all I needed to do was plug the inside holes. I did this with some 1/4″ machine screws and lock nuts, and two 1″ wide fender washers with a #10 machine screw and lock nut. It doesn’t look pretty but it does the job. Air can only come in through the filter. You can use a coil and locked out 2 wire distributor with the FiTech directly. You can use a CD box and run a single phasing wire from the FiTech to the CD box. 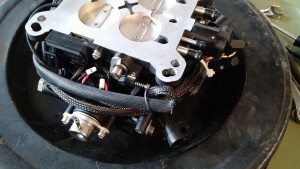 In both cases, you will need a coil and a 2 wire distributor. I am running a MSD 6AL2 Programmable which has more programmable rpm points than the FiTech. 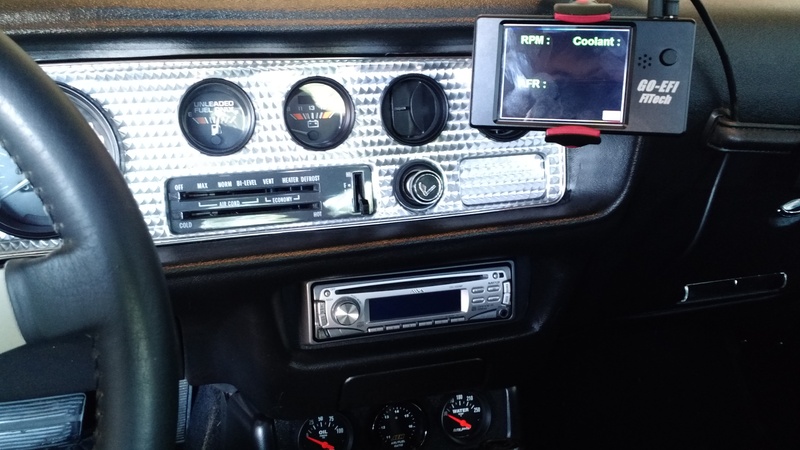 If I didn’t have the 6AL2, I would more than likely get a simple CD box and a Jegs Pontiac 2 wire distributor and let the FiTech control timing. 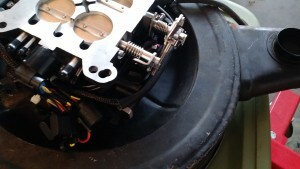 Fuel control center installation tips: I mounted the Fuel Control Center on the core support where the vapor canister mounts. I mounted it more toward the radiator though. 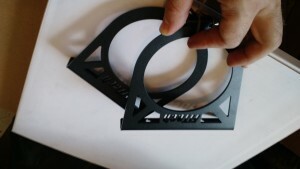 3 of the 4 mounting points are flush with the core support. One mounting hole I used a 3/8″ nut as a spacer. The core support has some pressed in indents for things like the vapor canister, a 3/8″ nut seemed to have the right height to bridge that gap perfectly. The mounting hardware that comes with the Fuel Control Center worked perfectly otherwise. If I took the time to look at all the parts before I installed the system, I would have purchased a 90 degree AN 6 elbow to attach the high pressure fuel filter directly to. Then I would only have one run of high pressure push lock hose to the throttle body. I’ve added this to the list of suggested parts below. 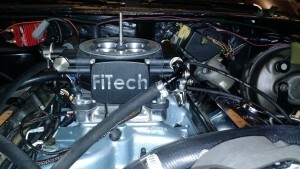 FiTech EFI installation tips: This was rather straight forward. In my situation I had to use a square to spread bore adapter. The adapter was great, but the gaskets it came with are not to be desired. 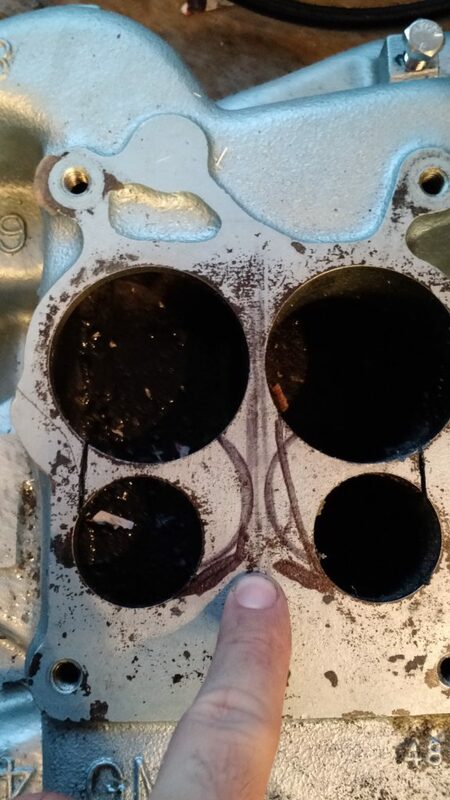 Specifically the Quadrajet side the primary holes were not in the right spot of the gasket. To keep the gasket thin I used a mr gasket one I had from a previous purchase. 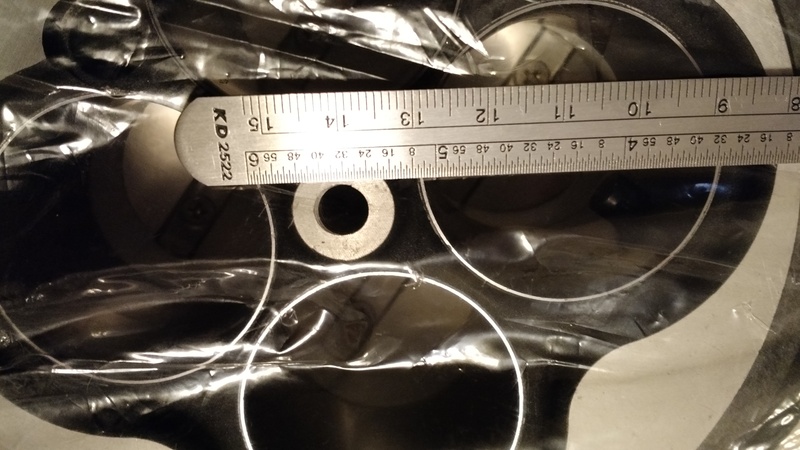 If you are using a spacer like the one I got that adds .8″ height, you want to use the thinnest gaskets possible (avoid the factory 1/4″ hardboard quadrajet gasket if possible). 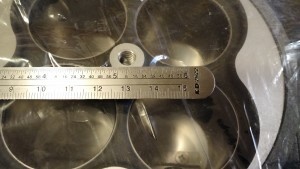 Some 1/4″ and 5/16″ hose and possibly a Tee for connecting the vapor line to the Fuel Command Center. If you are mounting to an intake that accepts both spread and square bore manifolds, you may want to purchase an Edelbrock 2732 1/16″ thick adapter plate (or equivalent). I’m pretty pleased with the ease of installation and the performance of the FiTech. 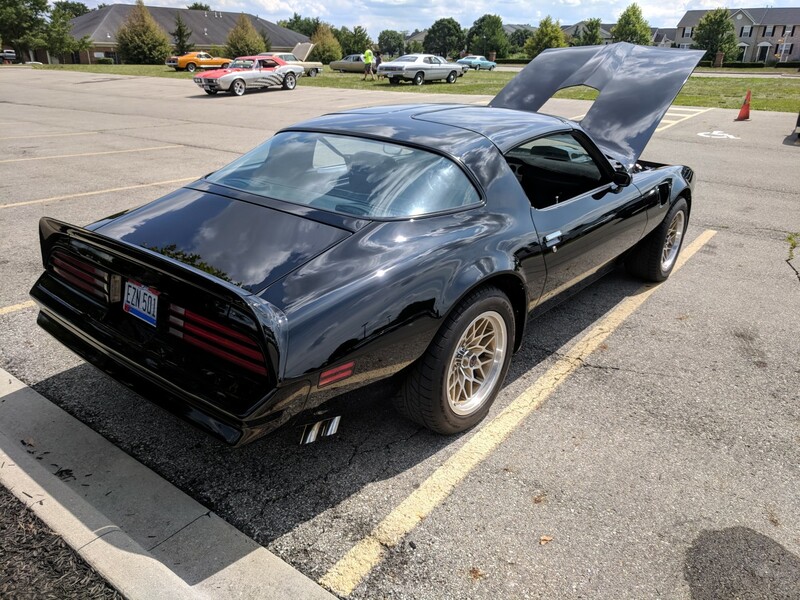 I now can hand my wife the keys and not worry about the car getting flooded or over cranked because she forgot to push the gas pedal down before cranking. I’m also pleased by the exhaust smell which is much cleaner at idle than it was before. 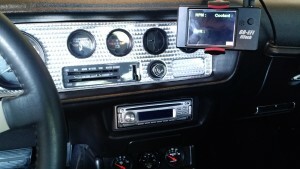 Hopefully the system is as rugged as it is easy to install and will last for years to come. 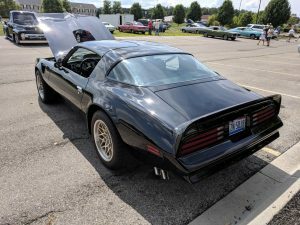 If you’ve been following project Trans Am, then you may recall that I had to replace the Pertronix Flamethrower distributor because it was acting whacky. I was temporarily running a Cardone distributor with light springs in order to get by for the winter. I maybe drove the car 100 miles with this temporary distributor, but it worked better than the Pertronix at least. Just to recap, the Pertronix for some reason was retarding the timing rather than advancing when rpm’s increased. When I discovered the MSD 6AL2 Programmable model last year, I was initially going to keep the Pertronix distributor, lock out the advance with some epoxy and replace the module with a 2 wire harness from MSD. Over the winter I found an MSD Pontiac distributor on eBay for a song. Smart move at first, then I discovered that I needed to buy another composite distributor gear because the shaft diameter used by MSD is not the same as the factory. I got a BOP Engineering composite gear for an MSD distributor. Though they cost twice as much as a bronze gear, the BOP Engineering composite gears are worth every penny. The composite gear I was using on the Pertronix looked brand new when I pulled the distributor out. 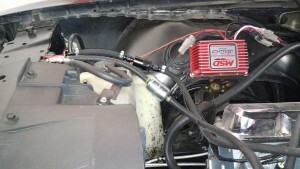 I am currently using Pertronix spark plug wires. Someday I will replace them with MSD 31193 Black 8.5mm spark plug wire set. I ran into one challenge mounting the coil on the firewall. The original plan was to bolt the coil directly to the firewall using the MSD mounting isolators. 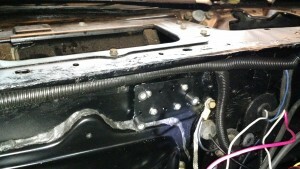 What I did not anticipate was that there was a gap between the firewall and the cowl, I would not be able to reach into this small gap and tighten the provided fasteners. I ended up fabricating a plate to mount the isolators to, then fastened the plate to the firewall using sheet metal screws. It came out ok, but if I did it again, I would mount the coil 90 degrees from how you see it now to prevent sagging on the 1 isolator side of the coil (see photos below). I programmed the 6AL2 knowing that the timing curve is actually retarded, not advanced. What I mean is, the MSD software lets you set the all-in timing, then you can map your curve from that timing in retard degrees. I set my initial timing between zero and 600 rpm to 20 degrees retard in the software (to be at 16 degrees). I set the 650-1,200 rpm to a 14 degrees retard (to be at 22 degrees at idle). I then charted my all-in point at 2,700 rpm to a 2 degree retard (to be at 34 degrees all-in). This makes the timing curve between 22 degrees and 34 degrees between the 1,200rpm and 2,700 rpm range. I set the timing to 22 degrees with the timing light at idle (if you are following, this is 14 degrees retarded from all-in point in the software). I decided on this initial curve for a couple of reasons; If I want to add 1-2 more degrees of all-in timing, I can without touching the distributor (you cannot advance timing beyond zero retard with the MSD software). I set the zero to 650 rpm to 16 degrees so cranking rpm timing is optimal (no more hard starting). The MSD 6AL2 Programmable Results Are Amazing! 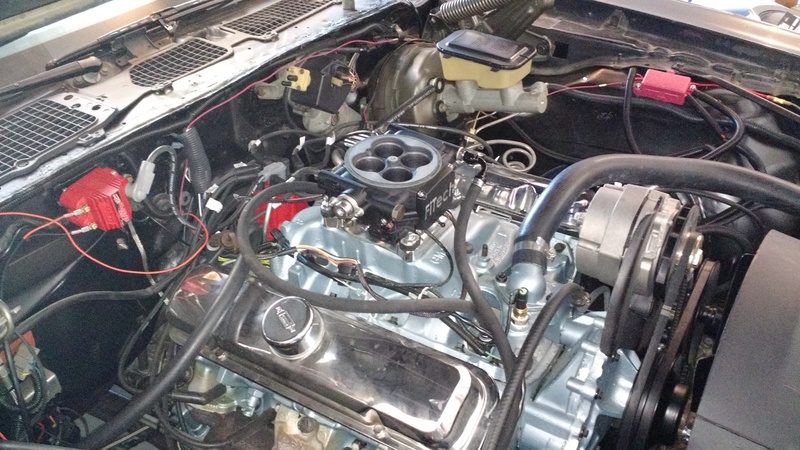 Since the upgrade, my engine now purrs extremely smooth at idle. When I hit the throttle then let off, the rpm’s quickly come back down. The engine also seems to burn the fuel better. There is definitely a noticeable difference between an HEI and the MSD system. If you are chasing a special timing curve that you cannot reproduce with weights and springs, I totally recommend the 6AL2 programmable. If you like controlling parts of your car with your computer (like me), then this is also perfect for you. I’ll never mess with a mechanical advance distributor again. 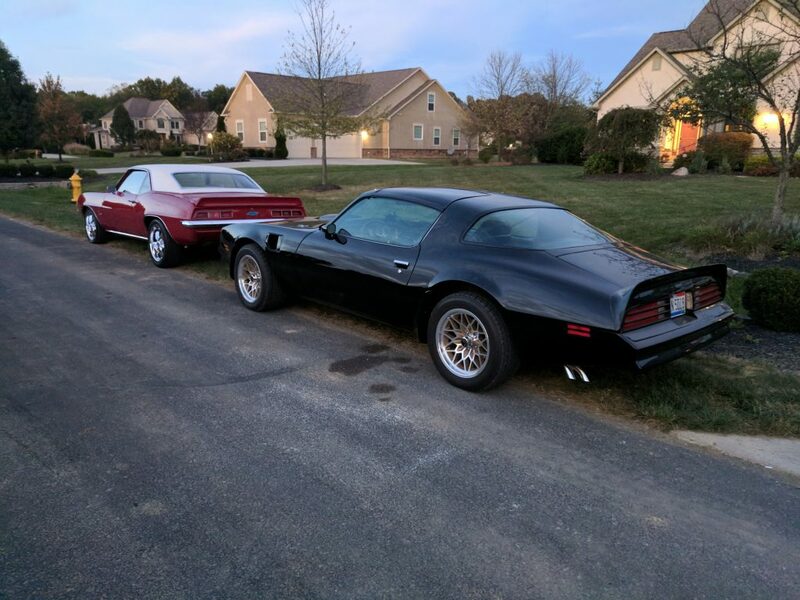 This early summer I got a few things tidied up with the Trans Am. 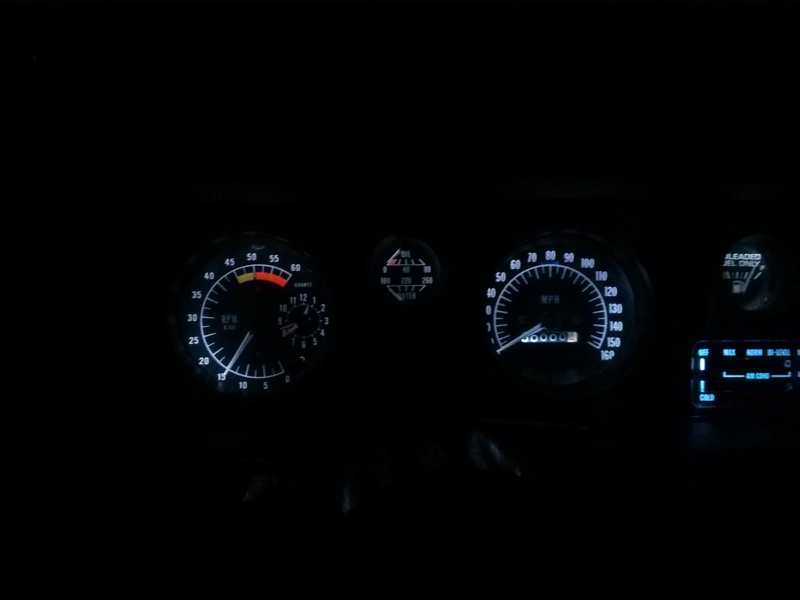 Three things that have been driving me crazy, that my factory tachometer doesn’t work, the odometer portion of my speedometer was not recording anything, and the red LED lighting is not as bright as I hoped. 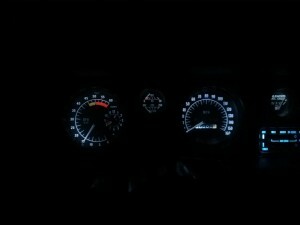 I tested white LEDs in a spare cluster I had in the house and found the white LEDs reflected better off of the factory light blue than the red LEDs were reflecting off the red reflective paint I used in my cluster. I then proceeded to take apart my cluster and painted the inside with a gloss white paint. 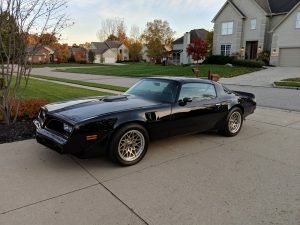 While I had the cluster apart I swapped out the speedometer with a 160 mph speedometer from a 1973 Firebird I picked up at a swap meet this March and I swapped out the tachometer from the spare cluster. I then found the clock from the spare cluster was broken, which lead me to take apart the cluster again to delicately swap the clock portion only. 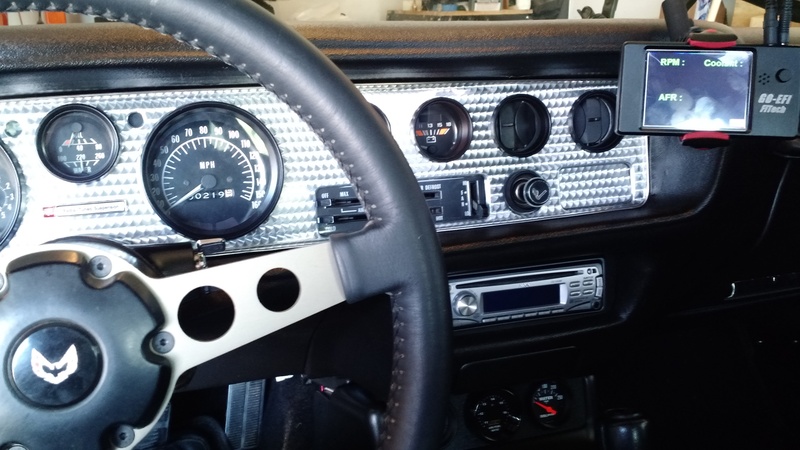 Replacing the clock on a 79-81 is not an easy task, you have to remove all of the needles from the clock and the tachometer in order to safely remove the clock. I also painted the inside of the fuel volt meter gauges with the same gloss white. While I had the dash apart I replaced the headlight switch and replaced the printed circuit behind the cluster with a new one. The results are fantastic, the tachometer matched the reading from my 2″ AutoMeter tach. The speedometer is now recording miles as well and the speedometer needle is very accurate and no longer twitchy. 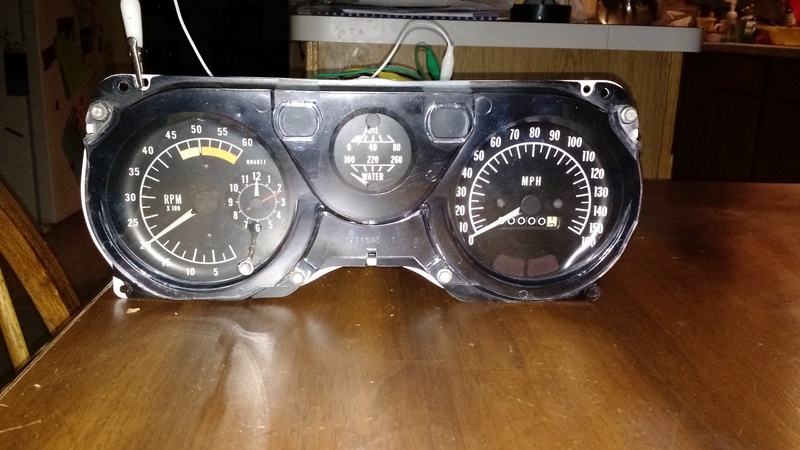 While I took the old speedometer out, I discovered the gear that runs the odometer was broken, which explains why the odometer was not recording. 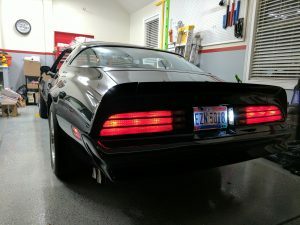 Since I got the Pypes system installed, one of the most annoying problems with the exhaust has been the drone noise in the car caused by the X pipe. This drone was not there when I had their X pipe system paired to factory log manifolds with a mildly built engine. 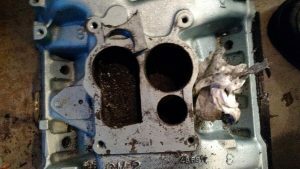 Last spring I had the motor gone over by Don from DCI Motorsports. He converted the motor to a roller cam, increased compression by shaving more off of my heads and also ported the heads. 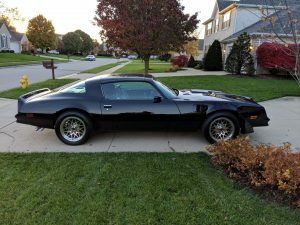 With the upgrade I decided to switch to Factory Ram Air 3 style exhaust manifolds, they are comparable to shorty headers except they are cast iron. Though These modifications I am sure caused the droning sound, it was unbearable. I also had some clearance issues with the pipes over the axles, no matter how I lined them up they were hitting the bottom of the car. 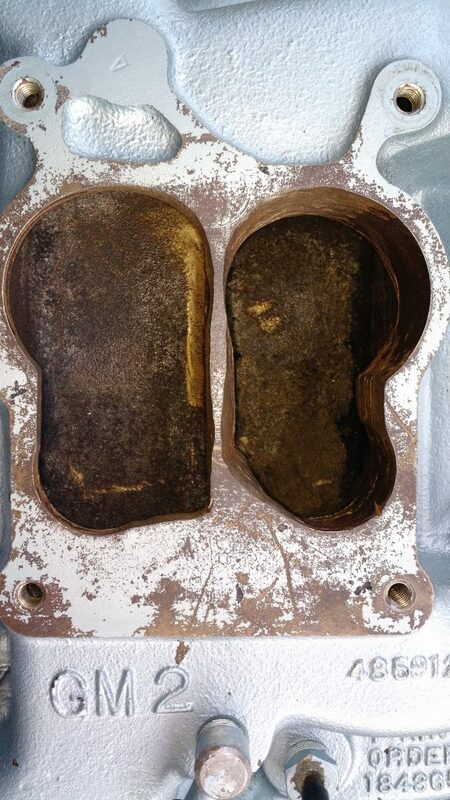 One other issue was with the down pipes. I had put them on the wrong sides. 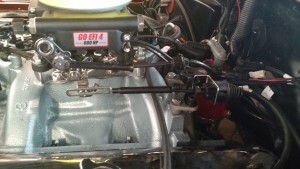 I was unaware at the time that the shift linkage needed the pipes to toe-in (for lack of a better description). 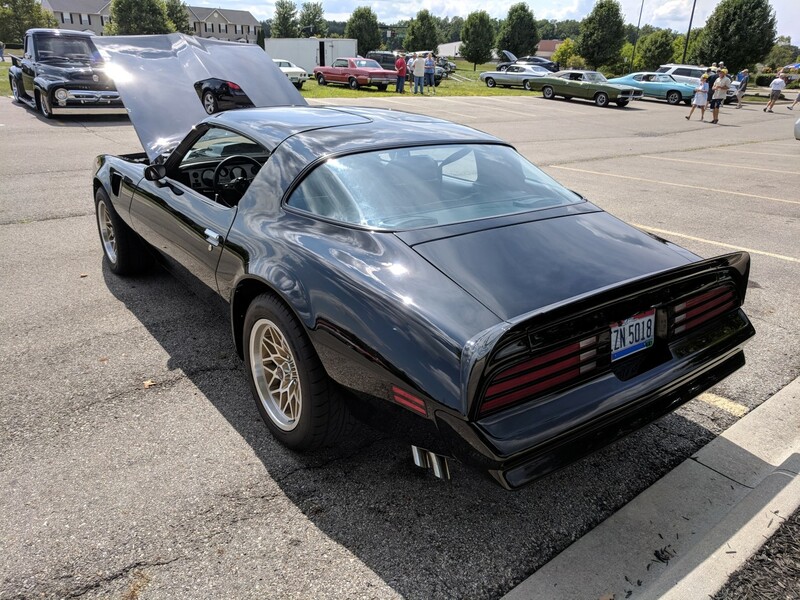 I’ve seen pictures of folks installing the downpipes both ways, so I assumed it did not matter, until it came time to button up the linkage with my steering column. In May I finally had all these issues fixed at a local muffler shop. While they had the down pipes off the car, I also had them add Oxygen sensor bongs. They did a decent job. 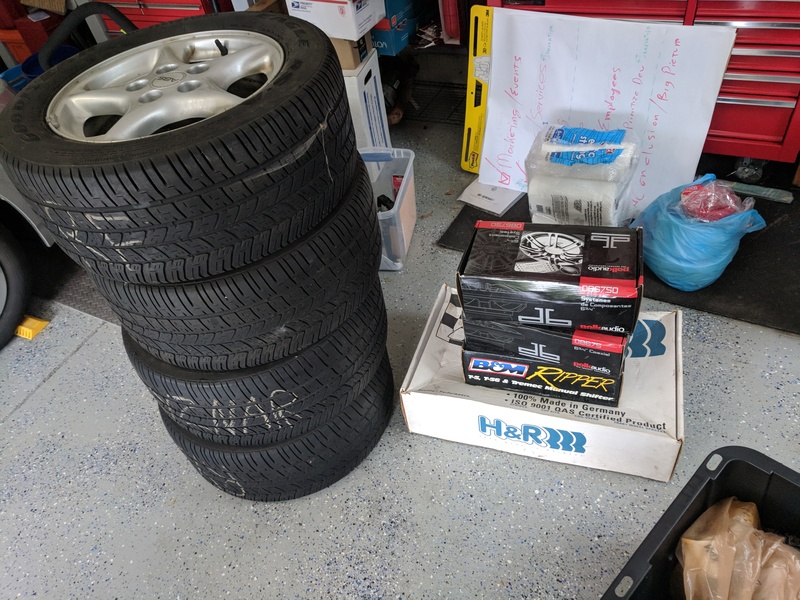 One of the down pipes is a little lower than I would have linked, but otherwise the system is no longer hitting against the bottom of the car around the axle, and I was able to utilize the bongs this August! MSD 6AL2 Programmable (purchased over the winter), AEM Air Fuel gauge, and FiTech Go EFI 4 with fuel command center. Sorry for the long hiatus. I did not work on the Trans Am over the 2014 winter.